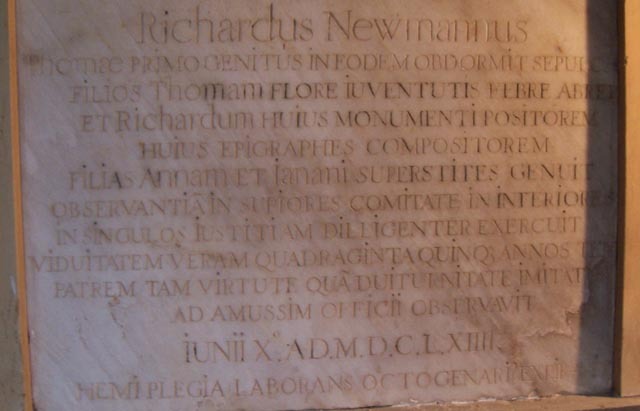 Notes on Richard Newman: Richard matriculated into Gloucester Hall, Oxford, on 18th June 1602. He acquired Sparkford Manor and the two Cadbury Estates in (or around) 1610, all in Somerset, making him the first Newman resident in Somerset. It seems that Richard went on to purchase the Evercreech Park estate in 1657 as documented in a purchase contract of that date unless it was his son Richard who is named in that document. If it was this Richard who purchased Evercreech, he is described in the purchase contract as resident in the City of Westminster, in which case it seems likely it was he who also purchased the house in Tufton Street that is referred to by Raymond Mercier as belonging to Richard's son. It is interesting to note that when Richard purchased Sparkford Manor and the two Cadbury estates in 1610, he was still a young man only 26 years. According to Campbell Newman's website money for their purchase came from his second wife "Elizabeth de Guise PERRY, of Castle Kenn, Somerset, sole heiress of the fortune of Christopher Perry and Elinor de Guise. This marriage to the grand-daughter of Sir William GUISE of Elmore, Bart.Royal, established his children in court circles close to their distant cousins Charles I and Queen Henriette Marie." However this marriage could not have taken place until around 1619/20, after the supposed date of the property purchases. It remains uncertain whether it was this Richard Newman or his son, Richard Newman, who lent large sums of money to King Charles I, who assisted King Charles II to escape after the Battle of Worcester in 1651, and who was imprisoned by Cromwell and rewarded (presumably by King Charles II) with an augmentation (a portcullis) to his Coat of Arms. Research by Harold Biggs suggests that it was this Richard (the father) to whom these anecdotes apply, however he would have been 67 years of age at the time of the Battle of Worcester, which makes it less likely. It is believed that it was his son Richard Newman who was appointed High Steward of Westminster at a date unknown. Ann and Jane: Richard is known to have had a daughter Ann who was the daughter of his first wife Elizabeth Symonds. Elizabeth is believed to have died in childbirth before 1619, so it seems . The above references to sons Thomas and Richard (1620-1695) imply that Thomas was the elder of the two and that he died young, leaving Richard to inherit his father's estates. Based on this, it is assumed that Thomas was Elizabeth Perry's first child and that he was born c.1619. Thomas Newman: As noted in my comments about Thomas (Richard's father) who shares the memorial with Richard: "It has been suggested by Tony Newman in the Newman Chronicle of April 1998 that the Thomas Newman buried near the entrance gate to the Fifehead Magdalen churchyard was the eldest son of Thomas Newman." This may be a correct deduction, however it is equally possible that the reference to "Son Thomas"on Richard's memorial refers to a son of Richard who died young. Elizabeth Symonds was daughter of Giles Symonds of Woodford Castle. Elizabeth Perry was daughter and heir of Christopher Perry of Kern, Somerset, by Elinor, daughter of Sir William Guise of Elmore, Bart. who was of Royal descent. According to Campbell Newman's website this marriage established his children in court circles close to their distant cousins Charles I and Queen Henriette Marie. Note: Tony Newman in his Fifehead.ged file states "Received grant of patent of augmentation from Sir Edward Walker, Garter King of Arms on 02 Apr 1664." I start to wonder if there is some confusion between this Richard Newman and his son Col. Richard Newman - including which of the two purchased Evercreech Park. Last updated: 16th Jan 2014 - Richard now assumed to be the eldest son of Thomas Newman. "Son Thomas taken away in the prime of life by an attack of fever" now assumed to be Richard's son Thomas. Last updated: 5th Aug 2013 - reference to uncertainty as to whether it was this Richard Newman or his son who was rewarded for supporting the Royalist cause during the Civil War.